Sam (Kelly Monaco) and Jason (Steve Burton) shared a passionate kiss. Jordan (Briana Henry) met with Margaux (Elizabeth Hendrickson) at The Metro Court. Margaux has a stack of letters tied with a red ribbon. She told the police commissioner how she’d been writing to her father to update him on her life since she was old enough to take pen and paper. Valentin (James Patrick Stuart) ran into Laura (Genie Francis) on the pier when he dropped his cell phone and Laura put her foot on his had as he went to retrieve it. Laura told Valentin that she was in Port Charles for as long as Valentin considered it his home. Mike (Max Gail) told Sonny (Maurice Benard) about throwing the gun into the Hudson River. Jason carried Sam and placed her on the sofa. As their kissing intensified, they heard a key opening the door. It was Alexis (Nancy Grahan) who came to pick up Kristina’s wallet because her daughter left it at Sam’s. Jason left. Nina (Michelle Stafford) told Lulu (Emme Rylan) about her (Nina) daughter Sasha Gilmore. When she found her mother at Morgan’s grave, Kiki (Hayley Erin) ordered Ava (Maura West) to leave. At Perks, The Corinthos family shared memories and stories of Morgan. Valentin accused Nikolas of faking his death. Laura vowed one day Scarlett would learn the truth about all he’s done. When he reminded she was only a grandmother to Scarlett in name only, Laura slapped Valentin. Kiki sat at Morgan’s grave and told him how wrong she was about her mother. At The Metro Court, Ava reminded Julian (William deVry) somethings were hard to forgive. Alexis questioned Sam about her relationship with Jason. Laura taunted Valentin about Nina leaving him and he being alone on Spoon Island. She warned to brace himself as the weather was about to change. Valentin came to Nina’s office to give her the news that the second DNA test results were in and they proved conclusively that Sasha was Nina’s daughter. He offered to help Nina figure out the best way to contact Sasha, but Nina told him she already left a voicemail. Michael (Chad Duell) told Jordan that Margaux was overstepping in her questioning of his father about her father’s murder. After the family left, Carly and Sonny spent time alone at their son’s grave but they were shocked when D.A. Dawson showed up at the cemetery. When Jason returned, Sam wanted to talk about their kiss. Carly (Laura Wright) and Sonny (Maurice Benard) were shocked when Margaux (Elizabeth Hendrickson) approaches them at the cemetery. Carly reminded that the D.A. didn’t even know their son. Margaux told them she wasn’t there for their son but for her father. The D.A. explained that she had her father’s remains moved their and now he and their son were practically neighbors. At The Metro Court, Alexis (Nancy Grahan) welcomed Laura (Genie Francis) home and the friends caught up. Oscar (Garren Stitt) overheard his parents talking about his treatment and the clinical trial. Drew (Billy Miller) asked Kim (Tamara Braun) what they would do if Oscar refused treatment. Kim reminds that until he is eighteen they have the final say and will force him to go through the clinical trial. Josslyn (Eden McCoy) texted Oscar and asked him to meet her at their park bench. Carly compared Margaux to Nelle (Chloe Lanier) and accused her of being vindictive in wanting revenge; the way the D.A. was acting was personal and hardly professional. Margaux laughed at Carly’s choice of words given her husband’s line of work. Sonny told Margaux that this was the last time she would come after his family. Drew told Kim how he wanted to be the father who made everything right for his son. Josslyn was happy to see Oscar in the park as it showed her that he still cared about her. Sam (Kelly Monaco) asked Jason to stay. They talked about their kiss. Sam told Jason it was different than when they kissed on New Year’s Eve and although she wanted him, she wasn’t ready. Jason assured Sam he could wait. Margaux told Carly and Sonny about the letters she wrote her father over the years but would never be able to give him because Sonny killed him. Carly reminded Margaux would never he able to charge her husband and would join the ranks of D.As determined to bring Sonny down. Kim told Terry (Cassandra James) that Oscar refused participation in the drug trial. Josslyn told Oscar how much seeing him meant to her after the difficult day because of the anniversary of Morgan’s death. She didn’t believe him when Oscar said he didn’t love her and never would. When Drew arrived, Sam told him Jason found Oscar on the pier and convinced him to call his parents. Margaux said something was wrong with Carly for standing by a murderer. Laura came to General Hospital and saw Elizabeth. They talked about Kevin (Jon Lindstrom) and Liz warned Laura not to ignore her existence that something was wrong. Oscar met with Alexis and asked a child’s rights when parents weren’t acting in his or her best interests, saying it was for a school report. Josslyn came to see Kim to find out what was wrong with Oscar. Margaux called Drew and told them they could help each other, suggesting meeting tomorrow at The Metro Court. Jason told Sam the next drink they shared would be a beer. At the school library, Josslyn (Eden McCoy) looked at a photo of she and Oscar (Garren Stitt) from the Nurse’s Ball when Cameron (Will Lipton) approached and encouraged her to do herself a favor a throw the picture away. Josslyn vowed she’s going to try to help him because Oscar is pushing her away because of the pain he’s going through. Kim (Tamara Braun) told Oscar how disappointed she was in him for treating people badly so they won’t care if he were gone. But Kim thought her son wouldn’t be better to spend time with the people he cares about and who care about him as studies show it helps with treatment. Oscar asked his mother whether she’d force him into a treatment he didn’t want. Kim answered if it helped him. Finn (Michael Easton) told Chase (Josh Swickward) and his father (James Read) that Gregory’s test result revealed he suffered from Post Treatment Lime Disease Symptom (PTLDS) and prescribed a course of treatment for Gregory to bring back to his physicians in Berkeley. 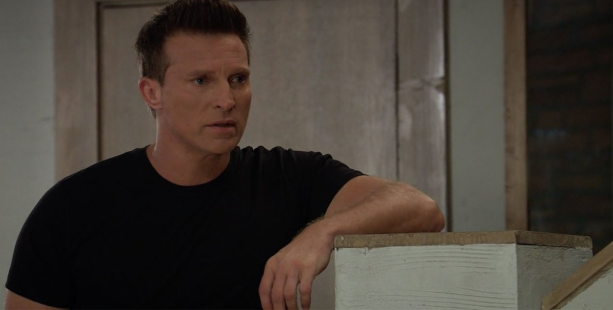 Jason (Steve Burton) told Sonny (Maurice Benard) that he (Sonny) should consider Margaux a threat. Jason also told Sonny about Carly’s idea to convince Margaux her father wasn’t an innocent victim in Scully’s illegal activities in order to get the D.A. to back off. Drew (Billy Miller) ran into Mike (Max Gail), Carly (Laura Wright) and Stella (Vernee Watson) before meeting Margaux (Elizabeth Hendrickson) for breakfast. Drew returned to his table with Margaux and the D.A. again asked his help to bring Jason and Sonny down. Oscar ran into Julian (William deVry) at the park and Jerome offered to be there for the teen if there wasn’t anything he could do to help. At General Hospital, Elizabeth encouraged Kim to take Julian up on his offer of support. Gregory told Finn that he, Chase and Chase’s mother have had a rich life together and that Finn was the only thing missing from it all these years. After his talk with Oscar, Julian came to GH and met with Kim. Dr. Nero admitted she’d fallen in love with “Charlie” and said how she told Oscar that when you find love you don’t let it go. Meanwhile, Cameron was annoyed when Oscar summoned him to the park to help him convince Josslyn of the breakup. Oscar said he wanted Josslyn to remember him as her first love not the boy she watch die. Cameron agreed to help but told Oscar that if what they did didn’t work, he’d (Oscar) have to come clean with Josslyn. Later in the school library, Oscar texted a photo that Webber helped doctored to Cameron of him (Oscar) with another girl. Josslyn was upset when she saw it. Sitting on the ground in the park, Oscar said goodbye to Josslyn. Carly told Jason and Sonny about Drew having lunch with Margaux at The Metro Court. Margaux told Drew that she had the flash drive that would help restore his memories as Drew Cain. Ava (Maura West) was reading The Port Charles Press while sitting on a park bench when she stopped Kiki (Hayley Erin) and Griffin (Matt Cohen) jogging by. From a distance, Ms. Jerome overheard her daughter and ex-boyfriend discussing their new relationship. Furious, Ava threw her newspaper in the trash and stormed off. Nina (Michelle Stafford) was nervous as she planned to meet her daughter Sasha (Sofia Mattsson) for the first time. Curtis (Donnell Turner) asked Nina what she’d hoped to gain from the meeting and commented how much Sasha reminded him of Nina. Laura (Genie Francis) was surprised to see “Kevin” (Jon Lindstrom) having breakfast alone at Kelly’s, especially since he left early without waking her. When Peter (Wes Ramsey) told Felicia (Kristina Wagner) how Maxie (Kirsten Storms) helped him board and elevator again and deal with a childhood trauma, Mrs. Scorpio questioned her daughter about her relationship with August. Margaux (Elizabeth Hendrickson) provided proof that she had the flash drive, and Drew (Billy Miller) accused the D.A. of blackmailing him with the flash drive to get him to flip on Jason and Sonny. When she met Scott (Kin Shriner) for coffee and told him about Kiki and Griffin throwing their new relationship in her face, Scott warned Ava she could be driving them together. Laura asked “Kevin” whether he was angry with her for staying away so long. Their conversation was interrupted by Felicia and Maxie’s arrival in Kelly’s. Ryan was passionate in his view that she was running away from the anniversary of the Ryan Chamberlain murders when Felicia told him she was going on a romantic cruise with Mac. After he left Kelly’s, Ryan bumped into Ava. Noticing she was upset, he suggested she come to his (meaning Kevin’s) office to talk as he had a cancellation and thought they had tings to explore. Then, Laura and Felicia talked about how differently Kevin has been acting Margaux assured Drew it wasn’t blackmail but a fair trade if they could hep each other get what they both wanted. Overhearing her call with Dante, Peter comforted Lulu (Emme Rylan) who was upset. After going over her piece, August suggested they go to the film festival to get her mind off of what was going on with Dante. Listening to the conversation outside Peter’s office, Maxie seemed to experience a wave of jealousy. Curtis showed Sasha the DNA test results proving Nina was her mother. After Ashford left, Nina asked Sasha her idea of a perfect day. Hearing Sasha’s answer, Nina told her she could see herself in her. When “Kevin” asked her what was the worst thing she’d like to do to Kiki to get revenge, Ava asked whether he was suggesting she murder her own daughter. Then laughed it off as a therapy ploy. Griffin brought unlimited passes for he and Kiki for the film festival. After their talk which went better than Nina could have hoped, she and Sasha decided to go for a coffee together. Carly (Laura Wright) and Michael (Chad Duell) arrived in court to testify at Nelle’s (Chloe Lanier) trial. Sam (Kelly Monaco), Alexis (Nancy Grahan) and Kristina (Lexi Ainsworth) had coffee at Kelly’s when Brad (Parry Shen) arrived with the baby. Chase (Josh Swickard) and Jordan (Briana Henry) were also at Kelly’s to celebrate Valerie (Brytni Sarpy) passing the detective’s exam and her promotion. At the park with Aiden, Elizabeth (Rebecca Herbst) and Franco (Roger Hogwarth) talked about what was bother the little boy who always seemed to love sick but was now faking being sick. Franco suggested a Halloween party for Aiden and Elizabeth wanted to invite her son’s entire class. Reaching into Aiden’s backpack, Liz found an envelope with a note from her son’s teacher. Curtis (Donnell Turner) told Valentin (James Patrick Stuart) that Nina (Michelle Stafford) and Sasha (Sofia Mattsson) are meeting as they speak. Curtis commented how devastated Nina would be if Sasha didn’t want to have a relationship with her. He added that Valentin should give up his plan to win Nina back. Nina questioned Sasha about whether she had the other half of the locket. Sasha told Nina she didn’t have the other half. When the young woman talked about when her mother helped pay for an expensive college trip to Paris and how she always wanted to go back, Nina told Sasha that she (Nina) was going to a fashion show in Paris next month for Crimson and suggested Sasha come with her. But Sasha declined telling Nina that she already had a mother and only agreed to meet Nina for closure. Nina apologized for coming on too strong and begged Sasha for a chance to start over. Kristina congratulated Valerie on passing the detective’s exam. Jordan and Valerie talked about what happened between Dante and Valerie. Jordan commented on how she wished she’d handled things differently. When they saw Nelle, Carly and Michael reminded she’d get what she deserved. Nelle talked about her grief over Jonah’s loss. Michael told Nelle to do the right thing and change her plea to guilty, but Chase said Janelle would never do that. He told her that her actions and own words would lead to her conviction. Jordan told Curtis that she and Valerie were getting back to a good place. Kristina told Valerie how she felt everyone was having success but she was being left behind. Elizabeth wonder what Aiden ‘s teacher wanted to talk with her about. Valentin joined Nina at The Metro Court. Nina sadly told Valentin how her meeting with Sasha didn’t turn out the way she’d expect; Sasha considers her adoptive mother as her only mother. Valentin comforted his ex-wife as Nina feared she’s blown things with Sasha. Nelle told Michael there was something he didn’t know that could change everything. When Brad came to the courthouse with the baby and saw Carly, Chase, Nelle and Michael standing outside the courtroom, he tried to flee without being seen but was spotted by Nelle. The Week In Review for General Hospital I wrote for The Nerdy Girl Express.